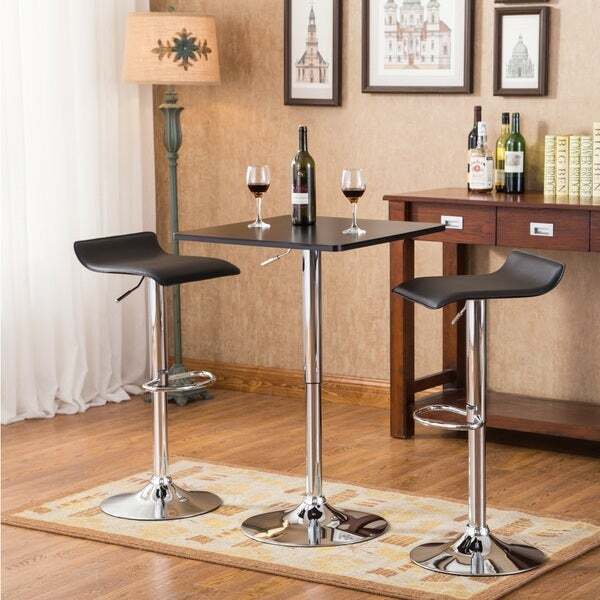 This bar table and two stools are easy to assemble. A great addition to my home Bar. We especially use it to hang out for a drink and to play games. A winner! Boasting a sleek design with a black-finished wood veneer top and black faux leather seats with chrome metal bases, this three-piece set makes an attractive accent to any room. Both the table and the two chairs have a convenient adjustable height feature thanks to a pneumatic, gas-lift mechanism, so you can cater this set perfectly to your own preference and style. Bar table features an adjustable pneumatic, gas-lift mechanism. I can not believe the quality for the price. Love it!!!! THIS ITEM WAS VERY EASY TO PUT TOGETHER. IT DOES NOT TAKE UP A LOT OF SPACE AND IT MAKES THE SMALL AREA IN MY KITCHEN LOOK VERY BEAUTIFUL. IT IS LIGHT WEIGHT. EASY TO MOVE AROUND IF I NEED TO AND EASY TO CLEAN. THE SEATS AND TABLE AS WELL BOTH ADJUST AND SWIVEL. IT IS A COZY SPOT FOR A ROMANTIC DINNER FOR TWO. IF YOU HAVE A SMALL KITCHEN SPACE IN AN APARTMENT THIS WOULD BE A GREAT CHOICE. This is being used in my computer room as a versatile table. I have it under a space saver for the bathroom and when I want to use it I can pull it away from the wall or leave it where it is. I like how it can either be a low table or a high table. Use it high when folding my clothes. It is very sturdy as well. I love the way this set looks and the function as well. Lovely little table set. Looks just like the picture. Brought it for my sons new apartment He loved it. Cute. I didn’t receive the table instructions in the box. The chair’s directions were minimal. It was easy to put together anyway. I like it so far. The price was one factor, I like the how elegant it looks, and It will work in the spot I need it at. I hope the chairs are comfortable. "Does anyone know if you can order additional chairs for this set? 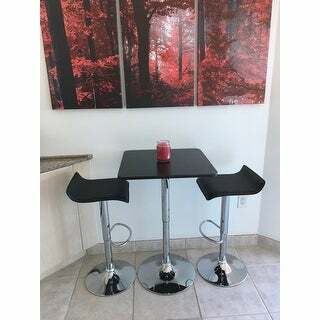 I love the look of the set but would like 4 chairs/set"
Obsidian 3pc Counter Height Square top with 2 Stools in Black.